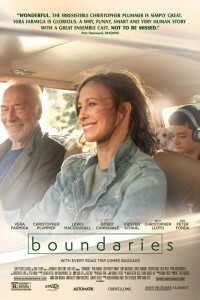 Beverly Hills – In the movie Boundaries, Laura (Vera Farmiga) is a single mother living in Seattle, who has a constant need to put others and animals before her. When her estranged, criminally-minded father Jack (Oscar winner Christopher Plummer, The Sound of Music, Beginners, All the Money in the World) is kicked out of his retirement home, Laura agrees to drive him down the coast to live with her sister JoJo (Kristen Schaal, Bob’s Burgers and The Last Man on Earth) in LA. Along for the ride is her bright but troubled son Henry (Lewis MacDougall), and an assortment of animal charity cases. Without telling Laura, Jack convinces Henry to help him sell off his copious supply of marijuana at every stop of their journey, resulting in unexpected reunions with old friends (Peter Fonda and Christopher Lloyd) and family (Bobby Cannavale). What does one do when two stars from a movie that were supposed to do interviews with you for that movie end up not doing them at the last minute? Oscar nominee Vera Farmiga (Up In The Air), who is the lead in Boundaries, an autobiographical drama from writer/director Shana Feste, stuck it out as long as she could with one-on-one TV interviews in the morning, but was failing fast with flu symptoms and couldn’t muster up enough strength to do sit down interviews in the afternoon, as scheduled. And Peter Fonda, who has a very minor role in the film, excoriated in the media earlier in the morning for an abhorrent Twitter post about Melania and Donald Trump’s son, Baron, decided that he was feeling “a little under the weather” and unable to do interviews. Fret not, as Feste and sixteen year old Scottish actor Lewis MacDougall (A Monster Calls), who plays Farmiga’s son, save the day at the Four Seasons Beverly Wilshire. Feste may not be a household name, but the writer/director who resembles a cross between Pink and Charlize Theron and could be one of the most breathtaking actresses in Hollywood if she wanted to, (since she writes and directs her own movies, especially), has been directing for a decade. For her first film, The Greatest, she directed Carey Mulligan, Pierce Brosnan and Susan Sarandon. In Country Strong, her second film, she directed Gwyneth Paltrow. And it was Alex Pettyfer she directed in the Endless Love remake in 2014. Next up for Feste, a horror film that she has been working on for over ten years. Boundaries Interviews by Tim Nasson and Dylan Tracy.